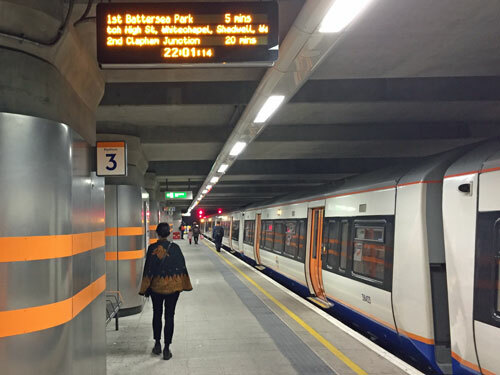 London has a secret Overground station, rarely served, and the destination of no more than one train a day. What's more it doesn't appear on diagrams in carriages, nor on any maps, unless you happen to look at the digital version of one particular timetable and there it is, the connecting track shown with 'Limited service'. Battersea Park used to be the penultimate stop on South London Line services from London Bridge to Victoria, but these were discontinued in 2012 when the Overground took over and diverted trains to Clapham Junction instead. 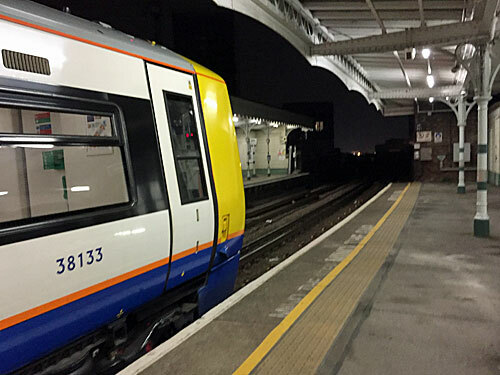 But the connecting spur still needs to be kept open, and drivers still need to know how to use it, so a parliamentary train service is run very early in the morning and late at night. I went to ride the only Overground train to Battersea Park, and chose a Friday night to provide a little added frisson. First up, yes, I can confirm that the final destination is made plain right at the start. 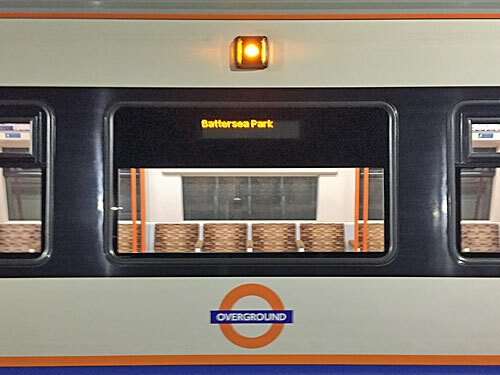 It reads Battersea Park on the Next Train Indicator, it says Battersea Park in the announcements, and it states Battersea Park on the displays in the train. Most people at Dalston Junction aren't travelling nearly that far, so would hop on a southbound train whatever it said on the front, but some passengers give the destination a second look. One particular bloke with a bike makes a point of watching the platform display scroll round until he's certain the train will be stopping at Peckham Rye, and only then lugs his wheels on board. Overground trains via Shoreditch on a Friday night are full of post-drinkers and pre-revellers, resplendent in all the latest on-trend woolly hats and pristine trainers. One has a cased instrument which doesn't quite look like a guitar, one is unwrapping a bouquet of flowers marked with a Reduced sticker, and three are having a loud conversation "so he used to be so like..." etc etc ad nauseam. A smart young lady boards with a large cardboard box full of designer homewares which she plops down on the seat beside me, then drops onto the carriage floor when she stumbles as she disembarks. A bearded youth with a nose piercing wraps the arm of his corduroy jacket around his girlfriend's shoulder and gets a button caught in her hair, which takes until the next station to untangle. All millennial life is here. At Canada Water it starts to matter that the train's destination is unfamiliar, as lines are soon to divide. The last person to slip through the doors before they close stares agitatedly at the scrolling display, uncertain they're on the correct train, because there are absolutely no clues on board where 'Battersea Park' might be, nor where the train will be stopping on the way. I'm expecting the driver to pipe in and say something at Surrey Quays, but he doesn't, so the recorded announcement that "the next station is Queen's Road Peckham" will have to suffice. At least one passenger near me, a woman in a Hakuna Matata hat, will dash off pretty smartish when we get there having accidentally taken the wrong branch. The train empties considerably at Peckham Rye, and even more so at Denmark Hill, now down to approximately 30 of us across five carriages. 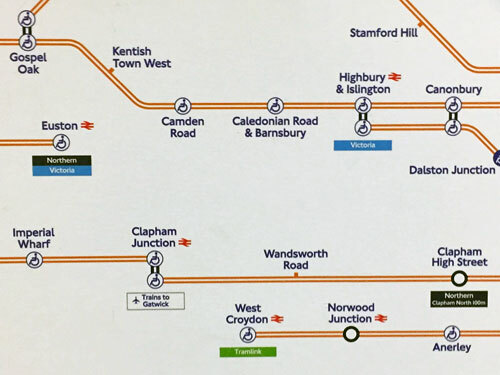 Anybody boarding at Clapham High Street - and there are only two - must only want to go a couple of stops and not to the usual destination of Clapham Junction, because we're not going there. Indeed the Battersea Park ghost train introduces a half hour gap in normal services, which is going to be bad news for anyone waiting at Clapham Junction for a train back the other way. At Wandsworth Road, the last stop before our train heads off the unusual way, only ten other passengers are still on board. Surely, I think, surely the driver will say something now. He doesn't, relying instead on passengers to make a logical deduction from the automated announcements "this is the train to Battersea Park" and "the next stop is Battersea Park". I'd like to be able to tell you all about the unique stretch of line this Overground train now takes, slipping off the usual path to rise up and across, but I can't because it was dark outside. I did enjoy a close up view of a train depot, then a bus garage, before passing directly over the platforms at Queenstown Road, but that's my limit. Before 2012 this was the normal line, of course, so you may well have ridden it many times. Indeed what's now the usual Overground route was previously the line taken only by the daily parliamentary train, which goes to show how much 'normal' can change. At last, one minute from our destination, the driver finally chips in and tells us what's going on. 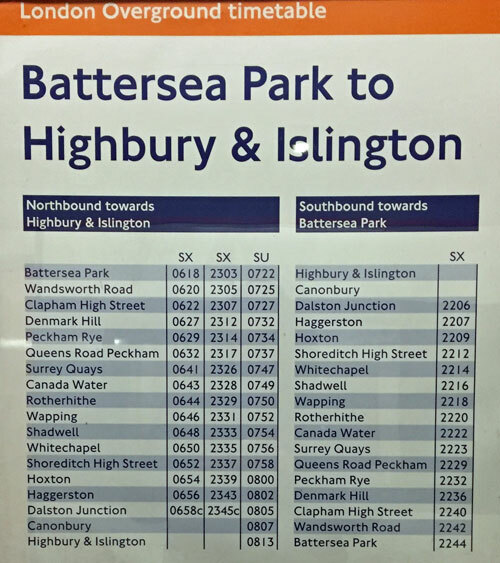 We get all the usual 'this train terminates here' and 'please check your belongings' stuff, plus an additional fact which helps explain why TfL have chosen not to put Battersea Park on the map. It doesn't matter if you caught this train by mistake when you were intending to go to Clapham Junction because another train heading there will be along very soon. Your saviour is the 2247 to Tattenham Corner, which will be departing the adjacent platform in two minutes, and most of those who've just arrived switch across to wait for that. I join the oddments heading downstairs to exit the station, having deliberately caught the only train of the day to somewhere I actually wanted to go. The pubs and kebabberies of Battersea are in full flow. Meanwhile the driver switches ends ready for the return trip twenty minutes later, in case anyone might want to catch a barely-advertised train late at night from a station it normally doesn't depart from. When I return to ride home I have the ghost train entirely to myself, as befits its status, at least as far as the first stop where the first bantering twenty-somethings start dribbling in. They have no idea they're on a special train, because in this direction it no longer matters, and business swiftly returns to normal. Only the driver and I know we're aboard something a little bit special, the parliamentary service from Battersea Park, the Overground's unmapped station, and long may it stay that way.